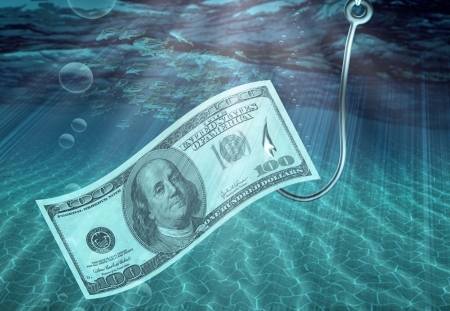 Your fishing reel is a critical piece of tackle; in fact, one could argue it is the most important of all the equipment you need for success at fishing. Sure, there are other tackle that are important too, such as your rod but, as well-made is it can be, the fishing rod has far fewer components that can go wrong in the middle of fighting that catch of a lifetime. So then, before we go fishing in a particular environment we want to make sure we have the right equipment, or we are potentially setting ourselves up for failure … sounds pretty dire, huh? Well, it can be in fishing terms – but fishing is supposed to be fun, right? In this post, we are going to try and maximize the fun, and greatly reduce the frustrations that often come with fishing by making certain we choose the right reel for the job. I’ve seen too many recreational anglers who think that any reel will do in any condition. To be more exact, I am referring to the absurd notion that the same spinning reel you use to catch largemouth at your favorite lake will also suffice when fishing saltwater. Would you attempt to play a round of golf with a ping pong ball? (ok, I’m sure someone has tried it!). Of course not. But that’s exactly what we are trying to do when we go saltwater fishing with freshwater gear. Your freshwater spinning reel is not made to withstand the rigors and abuse to which it will be subjected when you are fishing marine environments, whether it be fishing from the surf, pier or out on the boat in the bay. Generally speaking, a good saltwater spinning reel costs more than its freshwater counterpart because it has to be made from higher quality components and offer performance features that can stand up to the dings, sand, corrosive salt and, of course, bigger and badder fish you will encounter. The 3 saltwater spinning reels I will be reviewing are more geared toward shore and inshore saltwater fishing (though some of the larger models could certainly be used for some light offshore fishing as well). Though they are all unique in their own right, what they share in common is that they all offer unbelievable values given their low price, performance, quality of components and innovative features specifically designed to hold up to exacting saltwater elements. But unlike most of the other saltwater spinning reels on the market today, the models featured here can be had at a far lower cost – less than $100 for the majority of the models – while still providing top-notch performance and durability. Let’s dig in. Corrosion Resistance/Durability — Saltwater reels have to be constructed for durability in the face of the corrosiveness of saltwater. So we are looking bodies and spools made of either graphite, or anodized aluminum in most cases and shielded or, better yet, sealed stainless steel ball bearings (the number one cause of reel failure is due to corroded/seized bearings). Ball Bearing Count — Generally, the more bearings the smoother the reel on retrieve and increase in performance. All things being equal, choose a reel with more bearings. Gear Ratio/Line Retrieval — Gear ratio will dictate the rate of line retrieval. Lower gear ratios (e.g. 4:1) will let you fight a bigger fish better, while a higher gear ratio (6:1 and up) will give you a fast retrieval – think speedsters like Jack Crevalle, Spanish Mackerel, Kingfish, and Bonefish. Spool Size/Line Capacity — Unless you are targeting small fish, you need a spinning reel with good line capacity, especially if using higher strength monofilament line (20 lb test and up). If you are using braided line you can certainly pack on even more line while maintaining excellent strength-to-diameter ratios. Drag System and Power — This very important for saltwater spinning reels because of the type and size of fish you will be dealing with. Saltwater spinners are going to have bigger, multi-disc configurations for durability, more stopping power and performance under stress. I also like them better than rear drag systems because of their location and larger knobs for quick adjustments. Anti-Reverse — This is pretty much a standard feature in most spinning reels today, but its importance cannot be overstated. The anti-reverse feature prevents your handle from back-reeling (spinning backward); it lets you set the hook firmly on the fish and allows you to use the drag to feed line to it. A good saltwater spinning reel will have almost no backward play. The Kastking Kodiak is a new offering from team Eposeidon Outdoor Adventure. Launched in 2013 by college buddies with a passion for fishing and a commitment to producing quality “fishing tackle that everybody can afford”, Eposeidon has been making some noise in the recreational fishing tackle industry, taking home a Best of Show Award at ICAST 2015 in the new product category for its Kastking brand. The Kodiak comes in 5 models and is a solidly-built aluminum/graphite reel made to tackle saltwater fish. It comes with a solid anodized aluminum body, aluminum rotor and a CNC machined aluminum spool, all features that are extremely important when fishing the big ones. Add a stout stainless steel main shaft, brass gears, a carbon fiber drag capable of up to 39.5 lbs. / 18 Kg of stopping power (in the 5000 model) and a heavy-duty bail, you have a saltwater reel capable of fighting just about anything you might encounter inshore. Smoothness, performance, and durability are enhanced by 10 + 1 shielded stainless steel ball bearings. Generous line capacity in all models means you can put on plenty of mono and even more if going with the thinner braided line. The handle is interchangeable left/right and comes with an EVA knob for power and comfort and features an anti-reverse clutch. The gear ratio for all models is 5.2:1, giving the reel excellent torque and retrieval rate. Some have reported the bail on this reel can be a little tough to close when turning the handle after casting (a little grease and usage should cure this over time). The EVA knob is not a favorite with all anglers and could take a little getting used to. The reel’s shortcomings are minor, in my opinion, and should not be a deal breaker. This is a solid and well-made reel with the quality of components and features that are in line with more expensive brands. KastKing is a newer and smaller brand, but their Kodiak saltwater spinning reel line represents a real bargain given its overall quality and performance vs price point. Our next reel, the Penn Battle II, comes from one of the oldest and most recognized brands. addition to their deep lineup. This is an updated version of the popular Battle series that came out a few years ago. This reel features some important improvement which we will cover here. As stated, the Penn Battle II is an updated offering, with improvements made over the original reel. Notably, one of the things we really like about this reel is the upgrade to the ball bearings. In the original Battle, the bearings were only shielded – here 5 stainless steel bearings have been sealed, which makes a big difference when combating saltwater corrosion. Another major improvement is the redesigned front drag system which uses both sides of the HT 100 carbon fiber washers to put the brakes on hard-charging fish (drag power up to 25 lbs and an increase of 20% over the previous model) while improving performance and durability. No wonder the Battle II won the “Best Saltwater Reel” award at ICAST 2014. 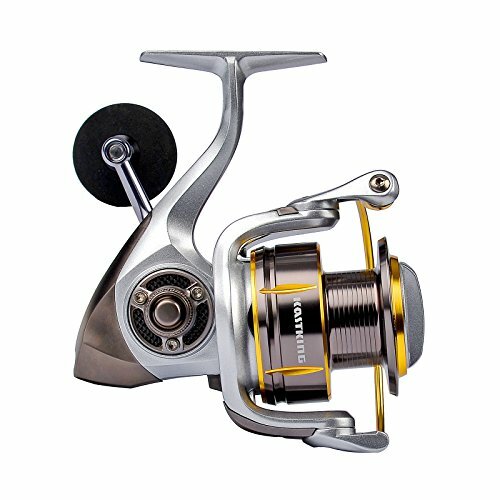 We also like the full metal body, sideplate, and rotor along with a more durable body paint that should only enhance the reel’s anti-corrosion properties. Other noteworthy features include heavy-duty bail wire, large line capacity, a Superline Spool that keeps your line from spinning (particularly useful with braid fishing lines), instant anti-reverse, left/right handle interchangeability and line capacity rings, a great visual aid to help you properly fill your spool and see how much line is left when fighting big fish. There are 8 models from which to choose, ranging from the Battle II 1000 to the 8000. Gear ratios run from 5.2:1 to 6.2:1 depending on the model and line retrieval rates are as high as 44″ per handle turn (112cm) with the Battle II 8000. The weight — even with all of the notable improvements, the weight of the models, particularly the larger models, remains a tad higher than other reels of comparable size. For instance, the KastKing Kodiak 5000 model weighs roughly 12.40 oz. while the Battle II 5000 comes in at almost 20 oz. Not the evenest line lay on the spool right out of the box. You may have to play around with the included shim washers to get the line to lay evenly. 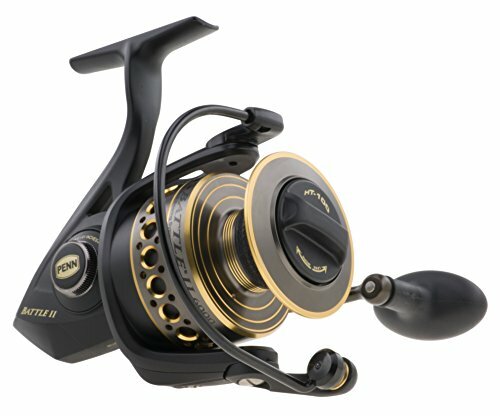 The slight weight and the initial uneven line lay issues notwithstanding, this is an excellent reel, especially when you consider the sealed bearings and high-quality drag system. This is a reel made to stand up to saltwater environments, and even the occasional accidental dunk in the water (providing proper maintenance is followed) should not prevent it from giving you years of pleasure. Our third and final reel for this review is the Daiwa BG, or Black Gold. Before we even get into the particulars, let me say that this is one of the most visually pleasing reels I’ve ever seen – it is simply beautiful! While Daiwa has been making the BG series since 1981, the new Daiwa BG Saltwater Spinning Reels presented at ICAST 2016 are more than just makeovers. Aesthetics aside, the BG is one of the best saltwater reel values ever produced, and the updated version may be even better. In fact, I’d call it a steal, with most of the models/sizes coming in under $100 and considering the high quality of components and design. The Daiwa BG spinning reel represents one of those rare instances where you feel you may be getting more than your money’s worth. Let me explain. Daiwa took an already popular and durable model and made it much better while keeping it very affordable. How so? Jaws (well, almost). The larger than normal gear not only provides more stability and drive-train power but also greatly reduces stress and wear. In other words, they designed the drive gear for superior performance and extreme durability. Then there’s the “Air Rotor“. No, it doesn’t operate on air, but even a casual look will tell you there’s something different about it. The unique design from graphite allows for a rotor that is more rigid yet lightweight. The spool is also made from anodized machined aluminum and is braid line ready. The spool’s reversed taper allows for smoother, longer casts and fewer tangles. The BG has 6+1 quality, shielded bearings setup found on much more expensive reels, gear ratios from 5.3:1 to 5.7:1, according to model, and a premium carbon drag system the company says is waterproof and rated up to 33 lbs. All models are braided line-ready, fairly lightweight, have excellent line capacity and come with high retrieval rates across the board. The biggest model in the series, the BG 8000, boasts of line capacity of 20/550, 25/440, 30/370 for monofilament and 50/730, 65/590, 80/440 for braid, and a monstrous retrieval rate of 53″ per turn. The sturdy screw-in handle minimizes play and can be switched to left/right retrieve. Sizes BG 4000 and smaller have an infinite anti-reverse clutch, and the larger models infinite dual anti-reverse. This reel doesn’t give you much to not like. I suppose I would have liked it better if the ball bearings were sealed like they are in the Penn Battle II, but you can’t have it all in this price range. You would be hard-pressed to find another saltwater reel at bargain prices that has any semblance of the innovation, performance and higher end components we’ve come to expect in saltwater spinners costing up to 10 times more, like the Shimano Stella or Daiwa’s own celebrated Saltiga. Now, I am not saying this reel is in competition with the two just mentioned – because it is not. Those are in another league in terms of sophistication and performance, but the BG is an affordable alternative that is going to raise the bar for the budget reel category. Though the other reels in this review represent excellent cost/performance values, the BG is in a class of its own and may be the best saltwater spinning reel for the money in this price range, period. The new Daiwa BG lineup is unparalleled – really – for budget reels. Its quality of construction, smoothness and overall performance are usually reserved for reels costing significantly more. All the reels we have looked at here are all winners. The KastKing Kodiak offers a lightweight design with lots of line capacity and outrageous amounts of drag, and the Penn Battle II is a solid saltwater performer with sealed stainless steel ball bearings, HT 100 carbon fiber dual drag system and neat features like line capacity rings. 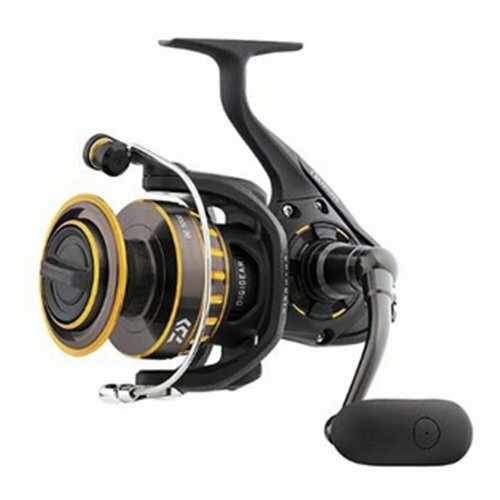 However, if you are looking for an affordable surf or inshore saltwater spinning reel that is aesthetically beautiful, well-balanced and smooth with components usually found in more expensive models – very little in the way of flaws – then you may have struck gold with the Daiwa BG. In our opinion, the BG is the best saltwater spinning reel under $100, but whatever your choice, you will not go wrong with any of the 3 picks reviewed here. This entry was posted in Tackle/Gear Reviews & Guides and tagged best sea spinning reel on February 18, 2017 by Avid Angler. I haven’t tried the other 2 but Kastking makes some nice inexpensive reels; got the 2000 for my light tackle setup and love it. Thinking about also getting the 5000 and putting on some 40-50 lbs braid for bottom fishing. If it’s anything like the 2000 I’ll be quite happy. Before this reel I tried a couple others and they did not hold up as well.